Looking for ideas and inspiration for teacher appreciation gifts or other unique gifts for special people? 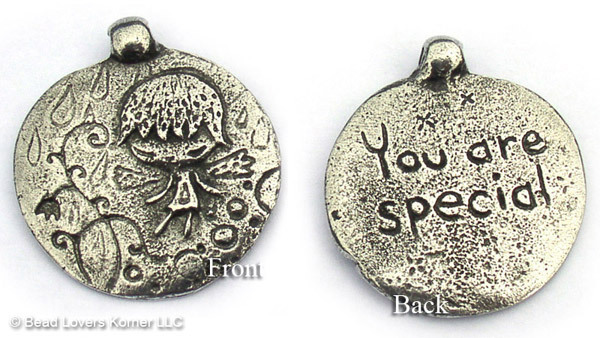 When I saw this jewelry making pendant from Green Girl Studios I was overcome with ideas for uses of this special little pendant. I raised children with ADHD (see my previous blog post on that subject) and met some very dedicated Special Education Teachers. This little pendant would have been perfect for making a unique gift for one of them. Comment below if this gives you any special inspiration or ideas for creating unique handcrafted jewelry! See other Green Girl Studios items in my Etsy Shop! Jewelry making and beading with fairies are a favorite for lots of different jewelry designers. I have always been fascinated with ideas of enchantment, magic, and undiscovered secrets. Doesn’t every one love a good Fairy Tale? Fairies have existed in folklore for hundreds, if not thousands, of years. Today in this age of computers and science, we don’t talk about them much anymore. Many people have tried to debunk these old and cherished fairy tales. Fairies have been known by many names all around the world. Names such as wee folk, fair folk, elves, pixies and many more. Fairies have magical powers, are sometimes mischievous, and are of a hidden society that can shape shift into different objects or beings. Who are we to say that they don’t still exist? Fairies have influenced art and literature as well as legends, and even traditions. Who hasn’t put a tooth under their pillow for the tooth fairy? Keep the magic and mystery of these stories and legends alive by incorporating them into your beaded jewelry. Create unique gifts that will become keepsakes of intrigue, and spark their own fairy tale! Find these and other unique jewelry making supplies by Green Girl Studios at the Bead Lovers Korner Etsy Shop.